Mark your Calendars and plan to attend if you live in the area of Ottawa, Ontario, Canada! 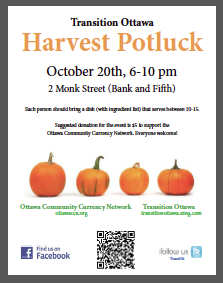 On Saturday, October 20 from 6:00-10:00 pm Transition Ottawa and the Ottawa Community Currency Network (OCCN) will be holding a fall potluck fundraiser. Join us for a delightful evening of seasonal food, conversation, and community building at 2 Monk Street, Ottawa, Ontario, K1S 3Y6. To help demonstrate how community currency operates, we will also be hosting an informal barter...more details to come!! Please stay tuned. Representatives from Transition Ottawa working groups and other community organizations will also say a few words about the various initiatives. This is a great opportunity to learn about what is going on in the community and decide how to get involved. 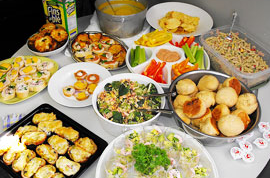 Each person should bring a dish (with ingredient list) that serves between 10-15. Also, please bring a serving utensil for your dish. Suggested minimum donation for the event is $5. Funds raised will go directly to support the startup costs for OCCN including: website hosting ($140/yr), association fees ($200), registration fees ($200), and other fees.